Anybody here drink Anhua Dark Tea? Anybody here drink Anhua Dark Tea? Pls talk the something the Anhua Dark Tea you drank. Re: Anybody here drink Anhua Dark Tea? Both from factories of Anhua region. Another of my favorites is some loose tea from Anhua, tian jian, or "heaven tip". While the OP doesn't appear to be breaking any forum rules, I am pretty sure this is just for advertising and / or search engine ranking, and not a sincere question. It would be smart if, as with links in posts themselves, links in users' profiles had the rel="nofollow" tag to make it at least a little harder to game the system. But, since we're on the topic, I thought this was a pretty funny episode of "The Splendid Table" recently, where her guest (Bill Waddington of TeaSource) acts as if no one had ever heard of hei cha before. I halfway wrote a comment about it, and decided to just not bother. I have only had Hunan hei cha once or twice -- if memory serves, the type that comes in a big log. On the other hand, I think it's a good thing that hei cha is more and more sold in US (previously there were mainly a few English language web store located in China selling them). It will be interesting to see whether people would get into them. I remember seeing the discussion of the radio cast on steepster. I listened to the first a couple of minutes of it. It doesn't actually sound as bad (or as arrogant) as the advertising line of the radio cast. I guess the radio people had to release a message of a "shocking new discovery" to catch audience, not that the speaker took it as something so new. Exactly. How to categorize pu'er is really complicated, and even on Chinese language tea forums, there isn't an agreed on "right answer". I think most people would argue that ripe pu'er is hei cha, but with raw pu'er, it gets a little dicier -- if young sheng isn't hei cha, at what point in the aging process (if any) does it become hei cha. I understand not wanting to confuse with our idea of "black tea", but do you think "black tea" is a better translation than "dark tea"? Oh I almost forgot I participated in this discussion a few years ago! I think "black tea" is the most exact literal translation for hei cha, because after all, dark is not the same as black. But it's not practical to call it "black tea", as the term is already taken. I guess hei cha would be an ok name as there is nothing hard to pronounce in it, at least no nasty letters like q and x But eventually the name used by the most people (or by the largest seller) will become the "official" name when more and more people use it. Also I feel I don't have thorough understanding of English words. It sounds to me that black means the color black, while dark indicates an environment in which you have limited vision (like darkness), or a color that's not as intense as black (like dark skin). Is that what these words are supposed to indicate or just my mental reflections? jennyzw wrote: Anybody here drink Anhua Dark Tea? Pls talk the something the Anhua Dark Tea you drank. 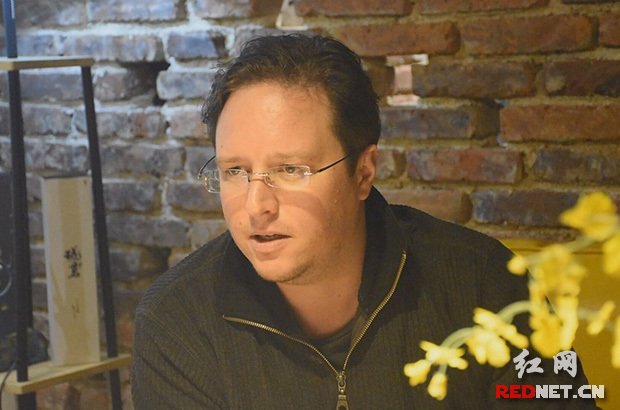 Anhua Dark Tea, Experience of Foreigners in China： Foreign friends in Changsha City talk about their experience of having Chinese tea. Hunan is one of the main producing areas of dark tea in China. Dark tea has been famous since it was sold along with Ancient Tea Horse Road. After years of opening up, Anhua dark tea goes overseas, and more foreigners in Hunan like dark tea. Elena, from Russia, said that Anhua County of Yiyang City is a particularly beautiful place where has many beautiful tea gardens. She said that the consumption of tea for Russians mostly depends on imports. "I think that Hunan dark tea tastes very good, I like it very much, and I heard that it is beneficial for digestion. I think dark tea will have a market in Russia," said Elena. Damion said that Chinese tea contains mutual respect among Chinese people. The Chinese use tea to pay tribute. He said, " Tea is the symbol of elegant Chinese culture. Dark tea is famous in China. It is my first time of tasting Anhua dark tea. I felt very comfortable and relaxed to have a cup of tea when I make friends. I enjoy it." An experiencing activity was launched in a Changsha dark tea house, which was jointly organized by the PR(public relation) Department of Anhua County and the Rednet Yiyang Station. 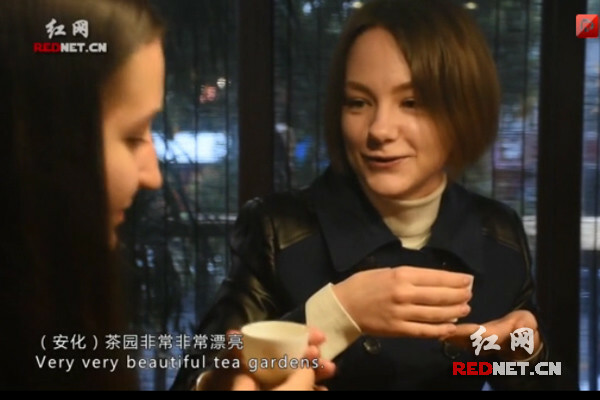 Foreign friends from the UK and Russia experienced the charm of Hunan's tea culture.